There was an upward trend in public preschool enrollment across all the racial/ethnic groups between 1995 and 2011. 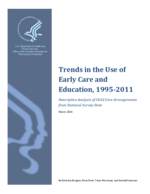 Across this time period, public preschool enrollment was highest for Black children, followed by Latino children, followed by White children (Figure 27). Note that these differences were not statistically significant every year, but the overall trend is evident. Asian and White children followed a similar trend across this time period, although the estimate of Asian children’s public preschool participation has greater variance due to a smaller sample size. Private preschool enrollment was consistently highest for White children, followed by Asian children, Black children, and finally, Latino children (Figure 28). Private preschool enrollment remained unchanged for Black, Latino, and Asian children, but White children’s enrollment declined from 35 to 29 percent during this time period.